Carol Cheavens Harrison is a Toronto artist, formerly of Winnipeg, Manitoba and USA. 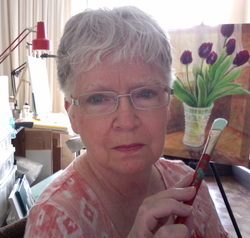 She paints in acrylic, watercolour, and other media. She studied at Baylor University in Waco Texas, received a Bachelor of Arts in Art from Meredith College in Raleigh North Carolina, and did post graduate studies at the University of North Carolina where she enrolled as an education major. Carol has taught art in public schools, has presented workshops on painting techniques, and has given group and private lessons on drawing and painting. She is an elected member of the Manitoba Society of Artists, a member of the Don Valley Art Club of Toronto, and a former member of the Local Colour Art Group in Winnipeg, and the Selkirk Community Art Centre of Manitoba. Her work is owned by private collectors in Canada and USA.